Abhay Sardesai visits the fourth Kochi-Muziris Biennale. Arunkumar HG. Con-struction I, Con-struction II. Sculptures. Repurposed wood, aluminium, concrete. 2015-18. Installed at Aspinwall House. 2018-19. 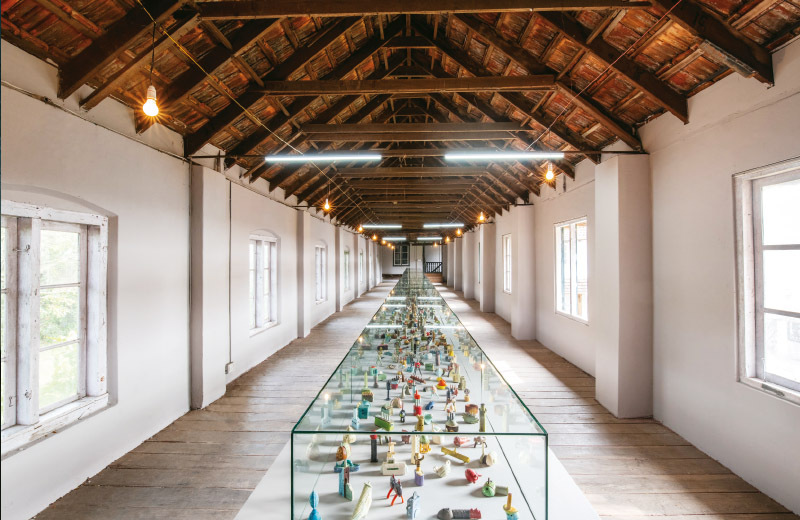 All images courtesy of the Kochi Biennale Foundation. A procession of swaying silhouettes makes its way across eight large screens bringing alive the circus of life – awkwardly prancing skeletons, religious demagogues, exhorting tyrants and burdened slaves file onward, lugging cut-outs of chattels, plants, patients, IV drips and animals. Drawing from the solemn energies of a funeral cortege and summoning the incantatory enthusiasm of a ritual parade, the advancing column feels achingly human, shamanic and spectral at the same time. Against the spirited score by a brass band, this work by the South African artist William Kentridge grows, as you watch with mounting thrill, into a metaphor for the messy but mesmerizing march of democracy. In its on-and-on-ness, the expedition loaded with omens and signs is corrupted into a journey without a destination. The fourth edition of the Kochi-Muziris Biennale, curated by artist Anita Dube, from the 12th of December to the 29th of March, is premised on exploring the affirmative possibilities of community life, calling out hegemonies and hierarchies and the exploitative enthusiasms they harbour. Headed as we are towards one of India’s most decisive elections, one that will determine the turn the nation as a secular unit will take, the show assumes significance as it installs acts of resistance and enquiry against deceitful, mercenary and hyper-muscular institutional presences to frame a discussion around justice and empowerment. The most ideologically self-reflexive of the four editions of the Biennale, it is also the finest. Heri Dono. Smiling Angels from the Sky. Installation. Fibreglass, lamp, wire, mechanical devices. 2015. Installed at Pepper House. 2018-19. As you enter Aspinwall House, you step into Durgabai and Subhash Vyam’s hall of stories. Featuring episodic turns in the life of a young girl who is protected and persecuted at different times by her family, you see the intensely imagined human figures as well as the flora and the fauna from the Gond folkloric world painted on wall-mounted plywood cut-outs. The fraught connections between natural and domestic worlds are unpacked as you dip in and out of the narrative. It is only when you move out of Priya Ravish Mehra’s darned and repaired clothscapes into the large concourse featuring Sunil Janah’s photographs recording the life of Santhals, Marias, Warlis and Malabari peasants that you detect clearly the curatorial insistence on exploring the marginalized identities of dispossessed people and reclaiming a pride of place for undervalued manual labour. Shambhavi’s agricultural implements – a tree of rusting sickles growing against a wall, for instance – and BV Suresh’s dark hall with disconcertingly tapping lathis, swishing brooms, shifting spotlights and dead peacocks as witnesses, compose tense moments of threat and violence. Is this the anticipation of a communal riot or the lull before the revolt of the proletariat? Arunkumar HG’s incomplete, rough-hewn headless figures made out of discarded wood, paper pulp and cement stand like disenfranchised demigods. Musical strains from a handloom machine repurposed by Mexican artist Tania Candiani trail across to these abandoned creatures. Dube chooses artists and works that confront acts of repression and discrimination, bigotry and brutality, in social and political life. Moreover, even as she steers the exhibits that interrogate iniquitous enthusiasms, Dube takes care to see that their mounting does not remain mono-registerial, where dry documentation passes off for living art. She helps facilitate the production of environments so that the displays generate experiences of anxiety, outrage and fear, among others, at different allied levels – substantively and formally, of course, but also spatially, dimensionally and atmospherically. Shilpa Gupta’s For, In Your Tongue, I Can Not Fit pays homage to 100 poets who have been persecuted at different times for raising their voices against rulers who have not been able to countenance the criticism aimed at them. A sense of unsettling menace pervades Gupta’s room as you make out pages impaled on spears in the dim light. Hanging over them are microphones that read out poems scrawled on the pages. As the recitations fill the space at different angles, you are made aware of the irrepressibility of the protesting, contesting words. 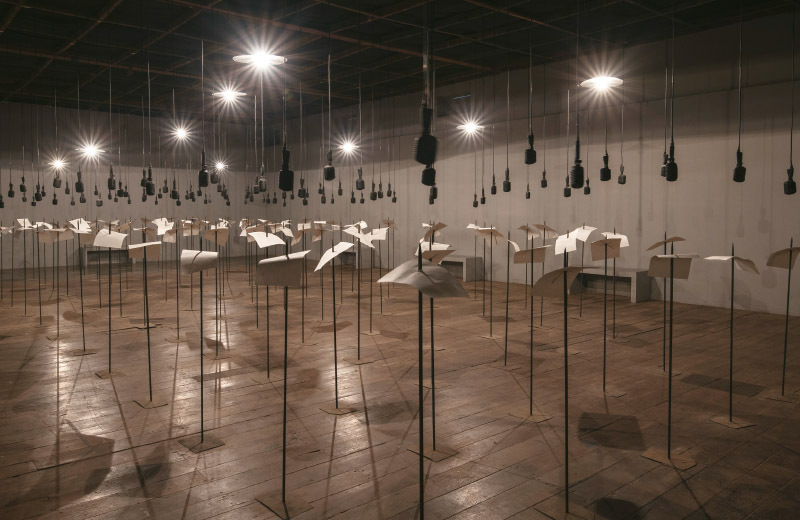 The work complements Someone Else, Gupta’s sculptural tribute to writers who faced censorship and wrote under assumed names and Singing Cloud, a suspended installation constructed out of numerous microphones that looked like a cross between a giant beehive and a tumorous jackfruit. At Pepper House, Australian-born artist Julie Gough sculpts coir crows that preside over shell heaps; between the casuarina cones, the hunting lances and the oak shelf, an oppressive colonial experience shared between Tasmania and India, aborigines and adivasis, is expressively indexed. Indonesian artist Heri Dono mounts a confrontation across rooms between winged boats and clown-faced angels hanging from ceilings. Drawing on Graeco-Roman mythology and South East Asian puppetry, and maneouvring the absurd charms of life-size toys, his work lays bare the subterfuge that drives war as both, tragedy and theatre. London-based Lubna Chowdhary’s Metropolis is composed of a thousand delicately laid out ceramic toy-like forms – towers and arches, bridges and spires, cones and funnels. These discrete details unpack the urban landscape, offering clues about its transforming vocabulary. Jun Nguyen Hatsushiba. Memorial Project Nha Trang, Vietnam: Towards the Complex – For the Courageous, the Curious and the Cowards. Single-channel digital video (13 minutes), floor filled with water. 2001. Installed at Aspinwall House. 2018-19. Instead of having disparate works by a single artist or a few works by many artists, Dube often eases a single project into occupying a room. This often deepens the experience of responding to the art and makes it less fatiguing for the image-assaulted viewer. In this biennale, there seem to be more women artists than men and Africa is well-deservedly represented by voices from across the continent. The South Africa-based artist Sue Williamson’s installations re-visit the slave trade between colonial India and Africa as Kenyan Cyrus Kabiru fashions chic, new-fangled eyewear out of abject material. Kampala-based Kibuuka Mukisa Oscar photographically records the break-dancing and skateboarding communities of young and poor men in Uganda as Johannesburg-based Zanele Muholi captures intense portraits of black and queer men and women. Africa comes across as a font of critical subcultures, of under-classes that are finding their centre and training their gazes at themselves sensitively and self-enhancingly. Is this a new reverse stereotype that is fast gaining ground – well-intentioned but slightly over-determined and even a little over-compensatory? Quite a few photographic series are on display and many, like the New York-based Martha Rosler’s ironic montages featuring scenes of war, domestic life and fashion, and the Beirut-based Akram Zaatari’s suite of posing married couples, reach out to you with their mordancy and wit. However, many projects suffer because of unimaginative installation – they are flattened against the wall, predictably and linearly, and fail to provoke the viewer inspite of their content. For instance, Jerusalem-based Palestinian artist Rula Halawani’s moving revisitation of childhood spaces and South African artist Santu Mofokeng’s brilliant evocation of black ghetto life during the apartheid fail to rise to the occasion and convey the emotional wallop they carry. Lubna Chowdhary. Metropolis. 1000 ceramic pieces, 46” x 65” table with acrylic top, white tack or museum wax. 1992-2018. Installed at Pepper House. 2018-19. 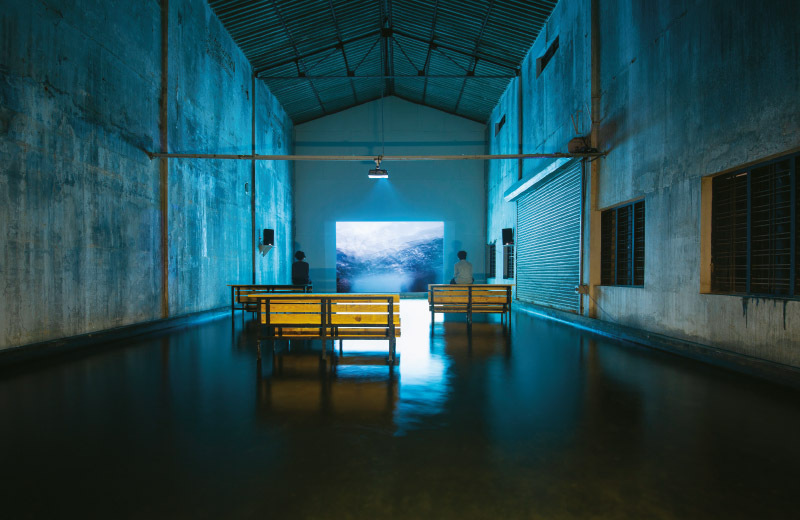 The Japanese-Vietnamese artist Jun Nguyen Hatsushiba’s film Memorial Project Nha Trang features men labouring underwater to ride and steer cyclos over an uneven seabed, soaring up to the surface to gasp lungfuls of air. The artists represents the precarity of life in Vietnam as corporatization makes sweeping lifestyle changes. Anjali Monteiro and KP Jayasankar’s film Saacha sensitively captures the death of Bombay as a textile city – Narayan Surve’s poetry, Sudhir Patwardhan’s paintings and the Shahir Amar Shaikh Cultural Troupe’s music prismatically assemble the changing face of the robust mill-worker community. Among the superstars, the Guerrilla Girls disappoint. As is well known, many of their iconic posters dip into a parodic register to expose a patriarchal mindset or supply facts about the lack of institutional representation of women artists. Acknowledging their status as pioneering countercultural icons, one wishes they had come up with a series of newer visual statements that spoke to the peculiarly curdled mix of casteist, racist, religious, classist and sexual prejudices that proliferate in our part of the world. Kausik Mukhopadhyay’s repurposed junk contraptions repetitively perform empty acts to generate a steady critique of proliferating use-and-throw consumer cultures. In close proximity to Mukhopadhyay’s ‘futile’ machines lies Bangladeshi artist Marzia Farhana’s dramatically hanging debris – furniture and electronic items rescued from the recent floods in Kerala. The kinship shared by the objects in these two projects and their closeness of location render a disservice to the separate enthusiasms they possess. Viewer responses to these projects seem to leak a little muddlingly into each other’s orbits. At the TKM Warehouse, Jitish Kallat’s ‘prehistoric tools’ are presented on a platform shaped like the hands of the Doomsday Clock – these larger-than-life sculptures speak to the intricate and intimate connections between cosmic processes, shifting temporalities and material lives. The Srinagar Biennale, curated by Veer Munshi, is an extraordinary project that revisits the social and emotional trauma that has accompanied the political unrest in Kashmir and the heavy price its citizens have had to pay over the last three decades. 14 artists respond to life in the suffering state – Gargi Raina’s painting of mourning crows, Rajendar Tiku’s solemn sculpted tools and Veer Munshi’s dargah with coffins create an achingly evocative space indexing love, loss and longing. To see the expressive drawings of KP Krishnakumar in the same space in Ernakulam’s Durbar Hall where four years back, you saw Hema Upadhyay’s rice-scapes, is a moving experience. Krishnakumar committed suicide in 1989 and Hema was murdered in 2015. Chittaprosad’s linocuts, woodcuts and caricatures installed there expose the pieties of the capitalist-politician nexus in post-Independence India and seem to share a kind of indignation with Krishnakumar in his brooding observations on desire and relationships. Easily one of the finest sculptural explorations of sexuality, Mrinalini Mukherjee’s poses in hemp, composed of mysterious hollows and delicate folds, creases and knots, recesses and shadows, bring alive the nobility of desire in the universal language of layers and textures. Shilpa Gupta. For, In Your Tongue I Can Not Fit. Sound Installation with 100 speakers, microphones, printed text and metal stands. 2017-18. Installed at Aspinwall House. 2018-19. Apart from being an accomplished artist, Dube is a trained historian and art critic. She was associated with the Indian Radical Painters and Sculptors Association in the 1980s. A heightened awareness about art losing its teeth because of compromises with overwhelming bourgeois contexts was at the heart of the group’s credo. The biennale has been conceived as a ‘Knowledge Lab’, says Dube. The desire to create uplifting ways of collectively experiencing life is seen in a project like Edible Archives at the Cabral Yard – meals are cooked by four women chefs using locally sourced vegetables, fish and meat with fifteen varieties of indigenous rice. Eating here becomes both a civilsational act (you meet, you converse, you share) and a profoundly expressive experience (you taste, you respond and you transform). Plagued by serious #MeToo allegations against the co-founder Riyas Komu, the biennale came under a cloud in 2018. However, over the last eight years, it has become the single-most important event on the South Asian art calendar. Krishnamachari Bose, Komu and their team have been unflagging in their commitment to the event and so has the government of Kerala. 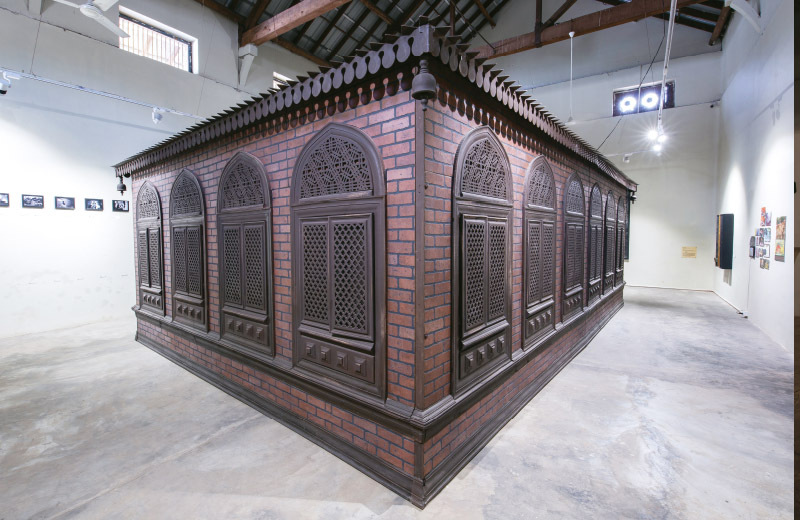 Even as she puts art with social conscience at the centre of her enterprise, Anita Dube’s biennale bravely contests the politics of hatred and aims to recuperate the figure of the intimidated, persecuted and tyrannized human being. Austrian artist Valie Export’s Fragments of Images of Contingence is a paean to the joy of living dangerously. Brightly glowing bulbs dip in and out of cylindrical containers containing oil, milk or water. The installation offers a striking takeway image and speaks full-throatedly to Dube’s vision. Taking chances is what an artist should do, Dube seems to suggest at a time when the freedom to defy is being displaced by the pressure to conform. A risk well-taken will only lead to pushing the boundaries of the imagination, to newer ways of being freer and fuller. Various Artists. Srinagar Biennale. 2018. The work above: Veer Munshi. A Place For Repose. Wood. 480″ x 720″ x 330″. 2018. Installed at TKM Warehouse. 2018-19.